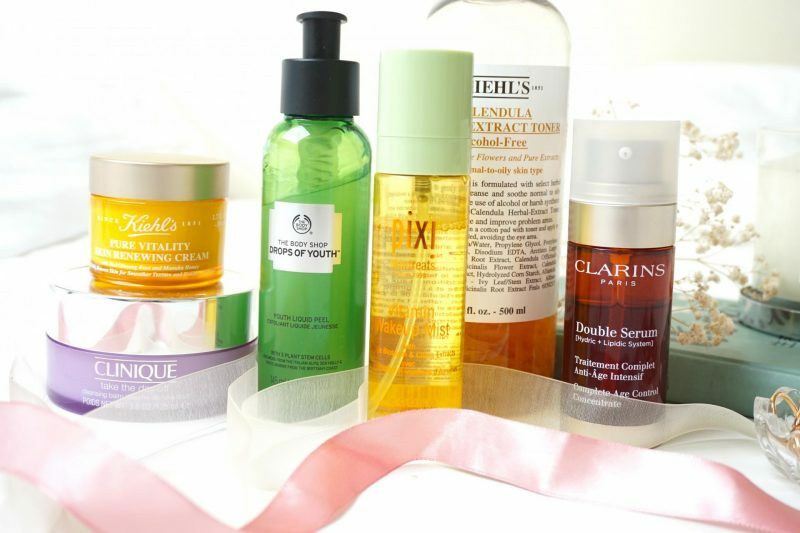 It is time for another skincare review! 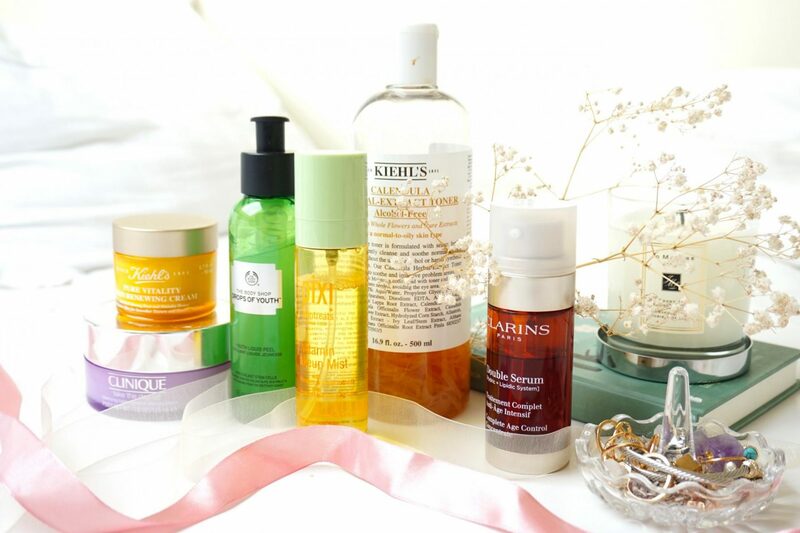 Today it is all about a few of my current favorites that make my skin happy and healthy. 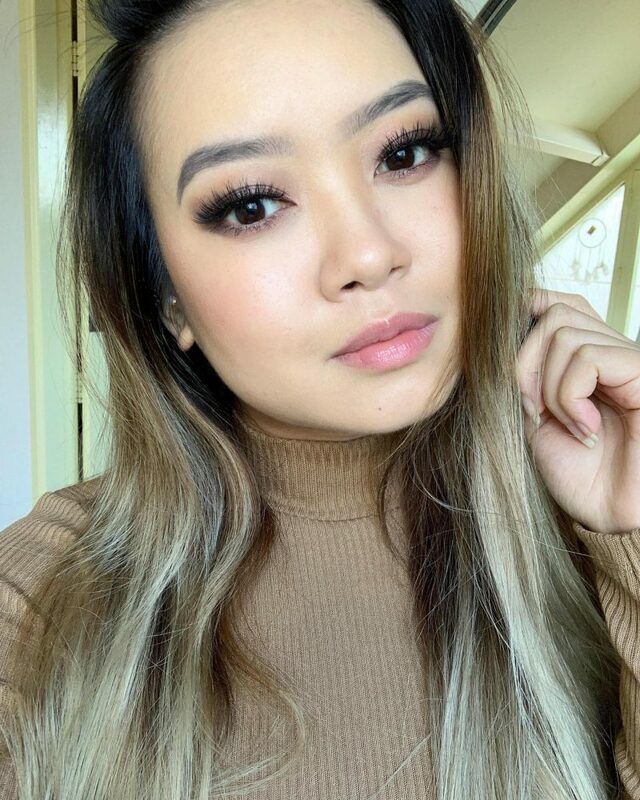 When the seasons start to change, so does my skin. I always have to switch my routine to keep my skin in top condition. I’m happy to have a skin without any harsh problems, beside the super oily skin I always get after one hour. I can get so exited by products that are easy to use or have a special packaging, what a simple person I am. It takes a while before I find a true beauty that works for my oily skin. 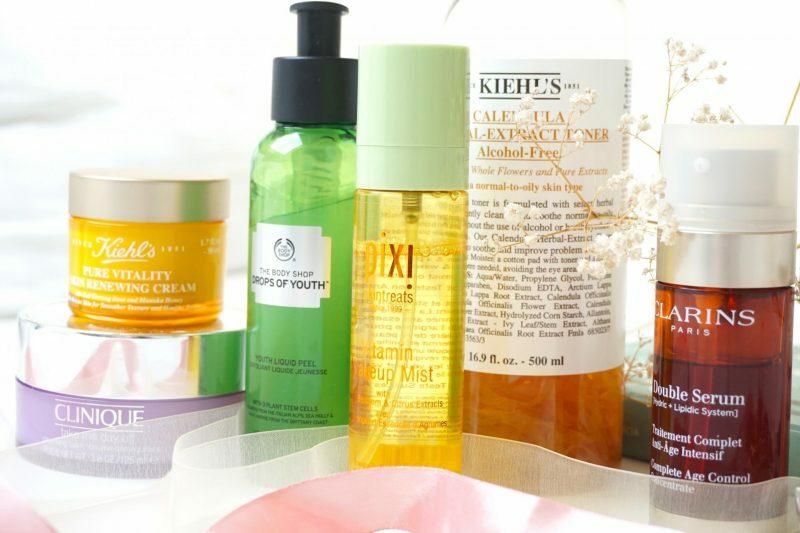 I tried to select different products instead of only serums or cleansing products, so you can have a idea what I like to use in my (current) routine. Let’s get started! 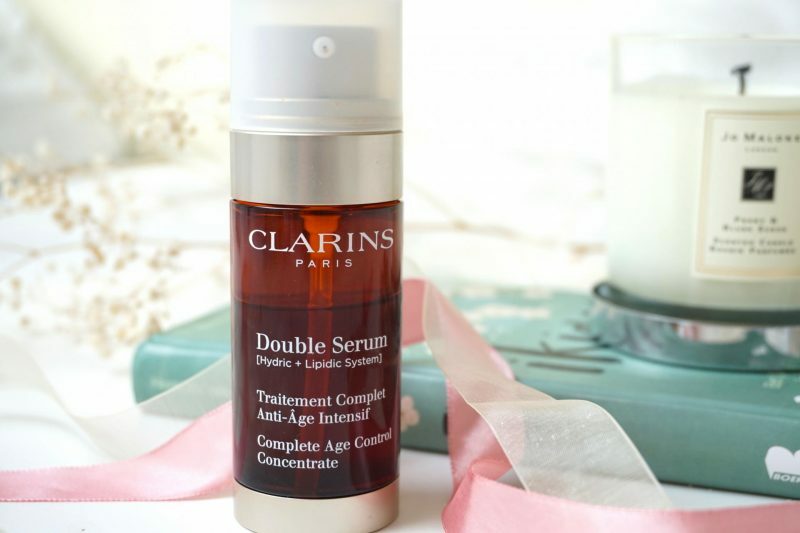 Clarins, Double Serum – I already talked about this serum before in my Clarins post and I can’t stop talk about this item. You never can start too early with anti aging items, even at my age of 24. The first time I tried this product was during the Clarins event: I never smelled something that delicious in my life besides food! It was the fragrance that convinced me to ask for this product. I use it every other day during the day or night, usually during the night as a serum or on its own to enjoy the fragrance and feeling. Everytime when I use this serum my skin says thank you to me! It feels healthy, it looks plumpy, hydrated AND I really noticed a permanent difference in the texture of my skin. I can’t imagine what to use when I don’t have this serum in my life, it really does magic to my skin on the days when it needs some TLC. 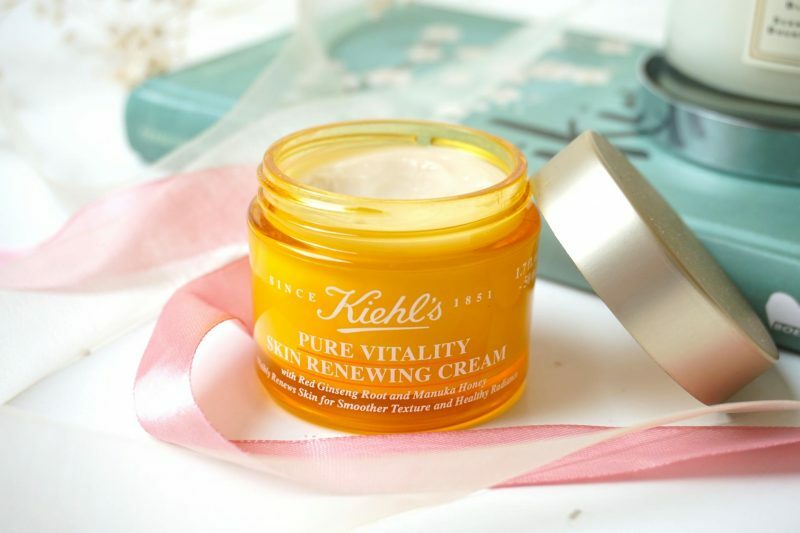 Kiehl’s, Pure Vitality Skin Renewing Cream – Red Ginseng and Manuka Honey are the main ingredients in this wonderful cream. The Pure Vitality Cream by Kiehl’s is a rich product, which is the reason why I only use it during the night. I think by now that everyone knows (or not) that I have a weakness for products that smell amazing. This cream is the best product for during your night routine because it gives your skin a spa feeling when applying it and the ingredients (especially the manuka) are really overpowering this product. I like to use this in my regular night routine and I apply some extra cream on my cheeks (I don’t know why, I just love it!). Whaaaoo, when I wake up it feels like I slept with a sleeping mask. It feels so soft and my skin looks super radiant! Some nights (or a lot of nights) I can be super lazy and then I use this cream on its own. Even than my skin looks ad feels amazing the next day. Get it now please, you won’t regret it and I will give you a refund if it doesn’t work for you (just trying to make clear you need it :p)! 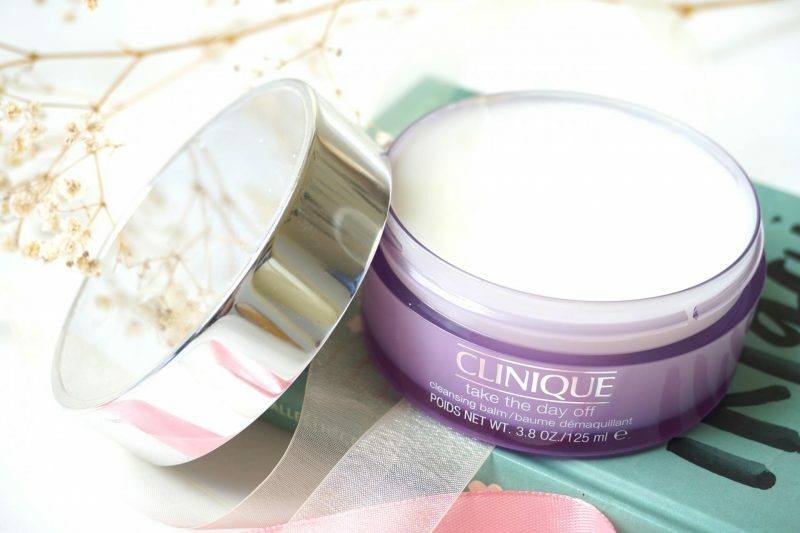 Clinique, Take The Day Off Cleansing Balm – You skincare junkies know what I’m talking about. Cleansing balms are taking over the world, why? Because the are easy to use, it feels luxurious on the skin and it takes all the impurities and makeup off! At the moment there are a few big cleansing balms on the market: Heimish (Korean), Banila Co (Korean), Pixi (Western) and the Clinique. I own the Banila Co, Pixi and Clinique and I can honestly say that the Clinique is the best out of these 3! You can literally have a full face of makeup and this cleansing balm removes everything, from your waterproof eyeliner to the glue of your false lashes. I was shocked how easy and fast it was to cleanse my face (I can almost say, as a Korean skincare lover, that I don’t need the second cleanse step). When I applied the balm on my face, it melts right away and at the same time your makeup dissolve. It happens within a few seconds. What speaks the most to me compared to the other cleansing balms is that I only need to massage my skin lightly with the balm and it takes everything away! With the others I still can feel a weird finish on my skin after I dried my face with the towel, also it doesn’t feels clean. Yes, this is my Holy Grail of the cleansing balms! 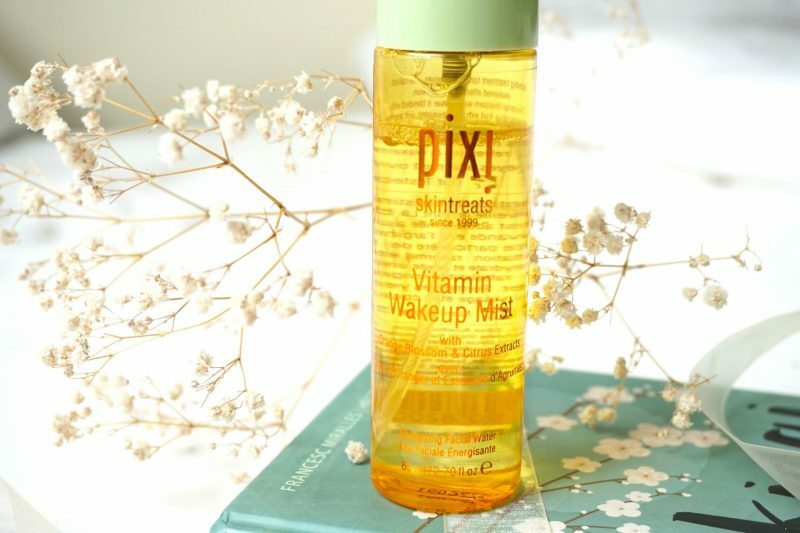 Pixi, Vitamin Wakeup Mist – Pixi recently released 4 new face mists with all a different function. This bottle really stood out for me: a wakeup mist? A girl like me can totally use this in the morning! Omg, again this items smells amazing like a breeze of fresh orange juice (when I close my eyes I can still smell it). Apparently everything that smells great is a must for me. It contains Orange Blossoms, Lavander and Citrus Extracts that will prep your skin for the day, giving it a boost and make your skin feel cool and refreshed. Just give it a few good shakes and spraaaaaay. On my days off this is the first thing I grab in the morning, it is easy and fun to use. To be honest I never been a fan of fixing or face sprays because my skin doesn’t need extra moisture because it already is so oily. But this is an exception because again, this smells amazing! 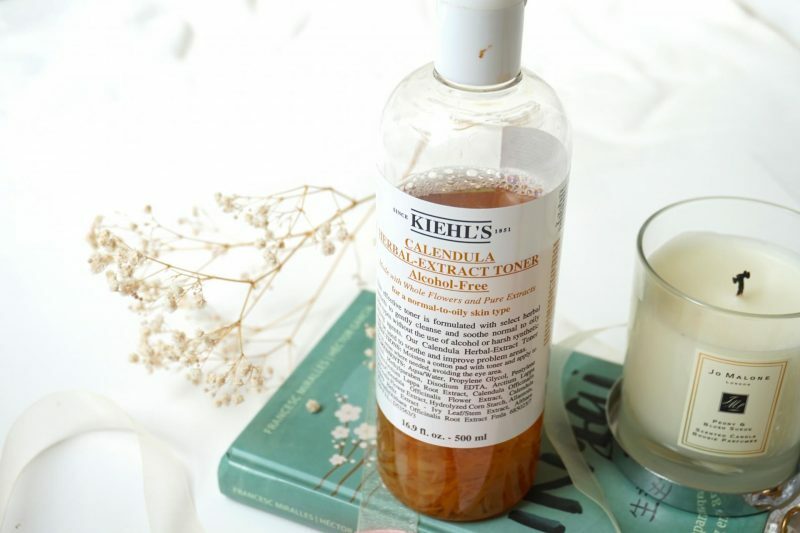 Kiehl’s, Calendula Herbal-Extract Toner – You know those moments you walk into a store, see something you need, grab it without checking the price and at the checkout you die a little bit on the inside. I had that when I purchased this toner from Kiehl’s but it was worth the money! Okay, I may be overreacting because it contains 500ml, but I was not prepared to pay such a high price (high for me, I usually get a lot of things through discounts or special offers). This Calendula toner is specially made for normal to oily skin and I can confirm that it works great for my oily skin! I loveeee this during the morning to prep my skin for my makeup routine of just a day without makeup. Do you see the flower petals on the inside? How beautiful! I always my toners on a cotton pad so I can evenly spread it on my skin. The Calendula Toner makes my skin calm, soothing and clean. Thank God that it doesn’t contain alcohol or any other harsh ingredient. I do have to say that there are many other brands out there on the market with exactly the same product for less, but I’m honestly a big fan of Kiehl’s (kind of afraid to say that because my boyfriend hates the whole apothecary concept of Kiehl’s :p)! The Body Shop, Drops Of Youth Liquid Peel – This is my first liquid peel item! What a great invention this is, so much result in a small amount of time. The Youth Liquid Peel by the Body Shop is a gel product which you have to apply on clean skin and start massaging it on the skin. The gel instantly starts to change in little gel balls and peeling of the skin which means it is exfoliating by removing the dead skin cells and impurities. You end up with soft, clean and super radiant skin! I’m not joking, my skin felt so soft like a baby bump, my cat’s fur or like the skin of a super model. You can’t imagine how much dirt came of my face, I was a bit shocked by the amount of ‘dead skin cells’ rolling of my face. Especially my neck was a little bit disgusting to see because I struggle with a lot of eczema there but it still worked without making my skin dry or irritating. If you are afraid to use a harsh scrub product, this is going to be your new toy! I don’t need to say anything, each of these products are wonderful! All of them are tested by me for at least 3 weeks so I can honestly say that they work great for my oily skin and that I enjoy them. Ofcours everyone has a few favorites in their stash and it was really difficult for my to pick only 3 out of them! Clinique Take The Day Off is absolutely my favorite because it makes me zen and calm when I use this cleansing balm on my face. It it so easy and relaxing when I start to massage my face and it takes away everything! Second is The Body Shop Youth Liquid Peel because I never used anything like this that makes my skin this smooth when I use this once a week. My skin feels like new after I used the peel and it looks more even and radiant. We must not forget the Clarins Double Serum, my lovely serum with the delicious fragrance that makes my eyelids shake (hahaha that sounds dirty). When I wake up after a night with the Double Serum, it looks like I had a facial. Plumpy, radiant and even are the results the next morning. Ooo I love all your picks An and so many of those are on my to-try list! The only one I’ve used is the Clinique cleansing balm, and I agree with all your points. I loved how easy it was to wash off and yay for no weird residue feeling afterwards! I’m such a huge fan of all of these brands but haven’t tried any of these fabulous products. Your skin always looks flawless so I have no doubt they are fantastic and I’m def going to pick up the Clinique cleansing Balm. It’s sounds amazing!! Such a great post! I really need to try the Kiehls Vitality Cream as I hear so many great things about it. The Body Shop Drops Of Youth Liquid Peel seems like a great product. i am going to check it out soon.